Joining the award winning Ed Table line, the IEA Island by CEF was inspired by the many makers in school systems, public libraries and museums across the nation that are dedicated to inspiring creativity and discovery in children and adults. By these educators pushing the limits of what can be accomplished in the classroom, we were challenged to create a piece that would help drive their efforts. The marriage of industrial design with warm wood, strength, and innovation, immediately inspires when you step up to the IDEA Island. It is offered in the simplest form-table only or can be dressed up with technology and seating for up to 8 people. The solid maple butcher block surface offers ample work space for brainstorming, hands-on STEM and is 1 -1/2" thick to endure years of use. Heavy duty 5" casters allow for easy transport, storage, and classroom layout reconfiguring for impromptu lesson changes. 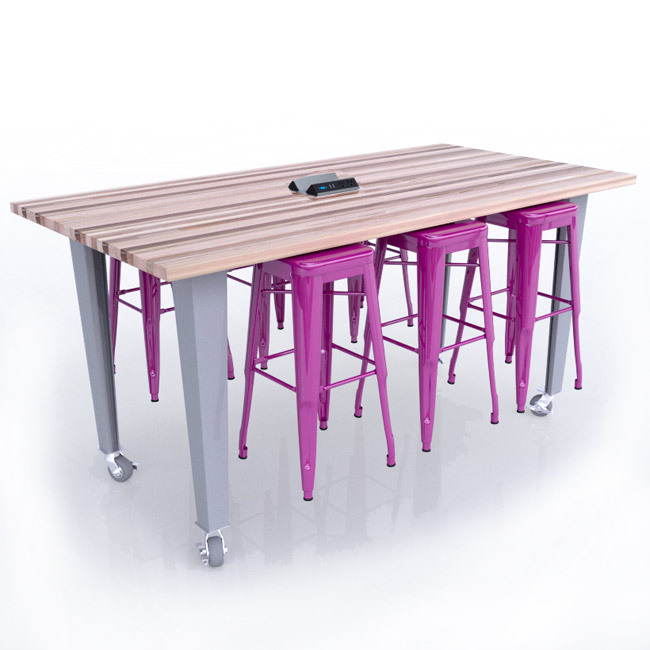 This table includes metal stools that provides a complete seating solution for your STEM learning environment. The stools can easily be stored under the table via magnet thus allowing the table and stools to be transported and stored with ease. In addition, a pop-up dual dock electrical station includes 4 AC power outlets, 4 USB ports, 1 HDMI connection, and 1 VGA port for including technology in all learning applications.